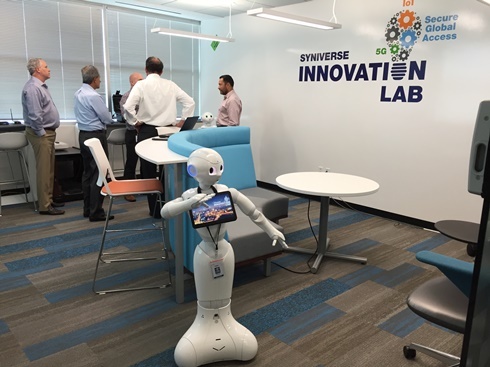 On July 19, we opened our new Syniverse Innovation Lab, and in my three decades at Syniverse, I have to say it’s one of the most exciting developments I’ve ever been involved with. Our Lab has gotten off to a fast start, and we’re already building big momentum. The Lab is a demonstration, development and testing center that brings together customers, partners and other technology players in experimental collaborations, and combines the best of our diverse skills and capabilities. Specifically, it’s designed to address today’s rapid digital transformation and speed the development of next-generation services for important emerging technologies like the internet of things (IoT), 5G, blockchain, Citizens Broadband Radio Service (CBRS) and artificial intelligence. 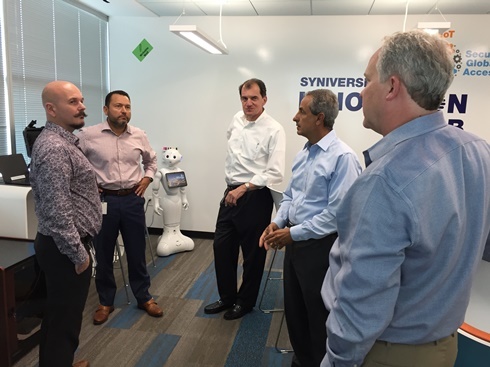 Me (right) and Richard Hodges (left), who is Senior Program Manager and a co-manager of the Lab, give a tour for Syniverse’s senior leaders, which include Dean Douglas (center), President and CEO; Chris Rivera (second from left), Chief Technology Officer; and Norm Korey (second from right), President, Americas. Customers get two benefits from the Lab. First, they can work with us on a deeper level in a highly advanced environment to customize solutions that meet their latest new-technology needs. Second, they can use these solutions to take advantage of the explosion of new business opportunities being opened by today’s newest technologies, things like smart offices and campuses that can be monitored and regulated remotely, or secure connectivity for drone management systems, or advanced testing for future 5G networks and unlicensed spectrum. The Lab is located at our global headquarters in Tampa, Florida, and co-managed by Richard Hodges, Senior Program Manager, who, in addition to me, is working with our customers and business partners to identify the best opportunities for collaboration and development. Richard helps oversee a facility that features a range of state-of-the-art technology, including the robot Pepper, a humanoid machine designed by SoftBank Robotics that greets and talks with visitors to the Lab. In the video below, Richard and Pepper explain a little more about the Lab space. One crucial technology underpinning the Lab is our recently launched Syniverse Secure Global Access, a private, isolated global network that enables businesses to protect their data in an age when technologies like the IoT are creating greater levels of risk for the public internet. This network is being integrated to ensure a high level of privacy and performance not possible through the public internet. 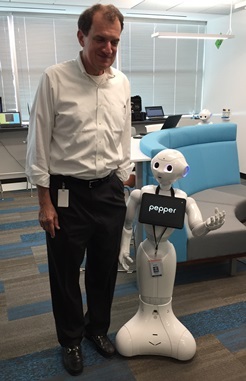 Our President and CEO, Dean Douglas, meets Pepper. IoT – Our IoT solutions concentrate on providing secure connectivity and driving new business value for both cellular and noncellular access. One of our first IoT applications, which is supported by Syniverse Secure Global Access, includes a smart parking lot that can identify vacant spaces by using noncellular connectivity featuring LoRa, a long-range, low-power wireless communication system. 5G – Our 5G solutions are designed around ensuring seamless interoperability between 5G and 4G. We’ve strengthened our expertise in this area by joining with Radisys, a 5G specialist that provides software for enabling 5G and 4G connectivity capabilities in a test environment, and then expanding that environment to Syniverse’s global network. These solution areas are just the beginning of what we see as an exciting new chapter for Syniverse, and we can’t wait to share more about them soon, right here on Synergy. In the meantime, if you’re interested in finding out more about our Lab or exploring a partnership opportunity with us, please contact Richard at richard.hodges@syniverse.com. We look forward to the opportunity to collaborate! Pepper looks to a bright future ahead with our new Lab.